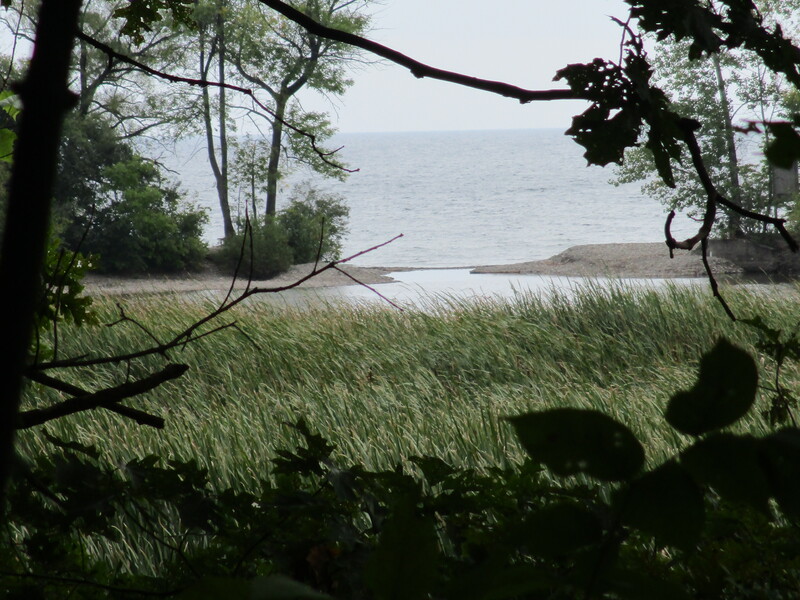 Rattray Marsh contains fossils that help form it, abundant wildlife and 100-year-old abandoned structures. And that’s just in the corner we explored. We set out to enjoy the last Saturday of summer and decided to visit the Rattray Marsh. There is very little parking at the marsh and so we parked at the Bradley Museum. James Rattray was born in 1887 and after having served in WW1 he made a fortune in the mining industry. He was friends with Percy and Ida Parker who owned the Riverwood Estate. In 1945 he bought the Fudger mansion along with 148 acres including the mouth of Sheridan Creek. The historical atlas shows that the creeks emptying into Lake Ontario along this stretch all had a marsh where they emptied into the lake. Today, the marsh on Sheridan Creek is the only one left between Toronto and Burlington. The rest of them have been filled in and when James Rattray died in 1959 developers started making plans to build homes on this one too. 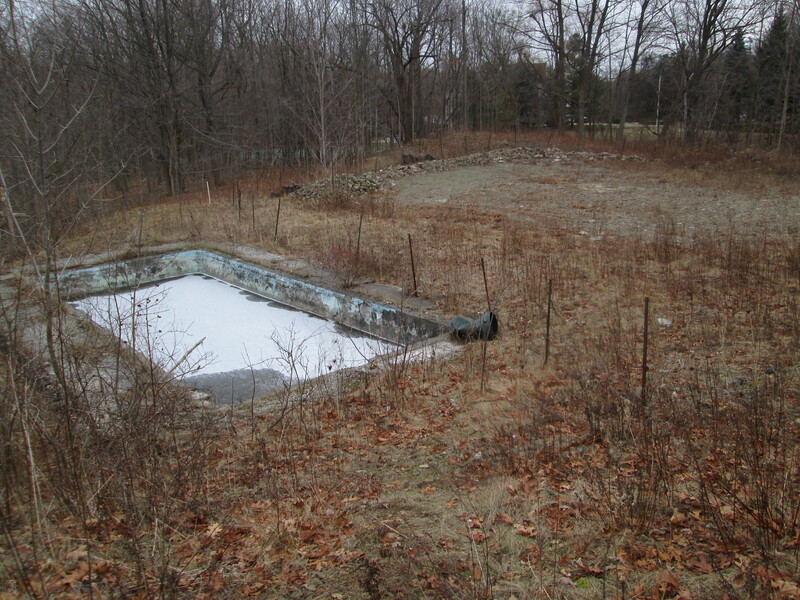 The Credit Valley Conservation bought the property in 1972 after local residents petitioned to have the marsh saved. 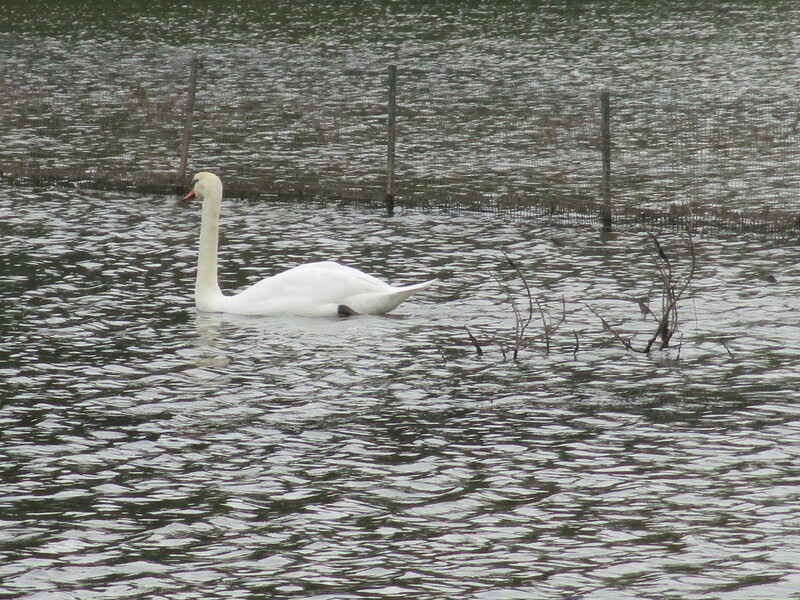 It was opened as Rattray Marsh Conservation Area in 1975. The shoreline along this part of the lake is made up of flat stones that have been rounded through years of wave action. They have been washed up on the beach in a wall known as a shingle bar. 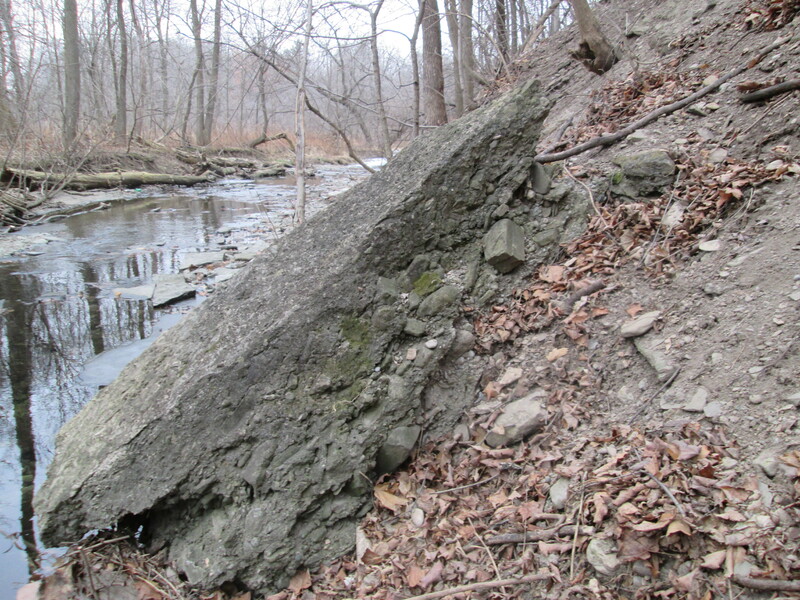 This rock barrier slowed and sometimes stopped, the flow of Sheridan Creek into the lake. The waters pooled behind this wall and silt settled on the bottom where aquatic plants took root forming the marsh over time. The picture below shows the mouth of Sheridan Creek and the rock barrier, or shingles bar, that maintains the marsh. The threat to the marsh actually started long before the developers made specific plans to fill it in. Without realizing it they had already initiated a slow process that would do so. As development occurred on properties upstream the amount of sediment in the marsh increased. Buildings, roads, and parking lots don’t absorb water like fields and forests do. Water runs off quickly and carries soil and other dirt into the creek. The water slows down in the marsh where this silt settles and quickly buries the natural ecosystem. To restore the marsh some of this sediment was removed to expose the native soil and allow the seeds trapped inside to germinate. White carp have also invaded the marsh and are disturbing the sediment on the bottom through their feeding. This has destroyed plant life and the habitat it provided. The carp have been isolated and are now kept out by fences in the marsh like the one pictured below. We did a little beach combing looking for interesting rocks and fossils. The wall of shingle stones along the shoreline is full of fossils. The remains of these long-gone creatures now serve to keep the creek out of the lake and helped the marsh to form. There were many small stones with multiple fossils of worms in them. 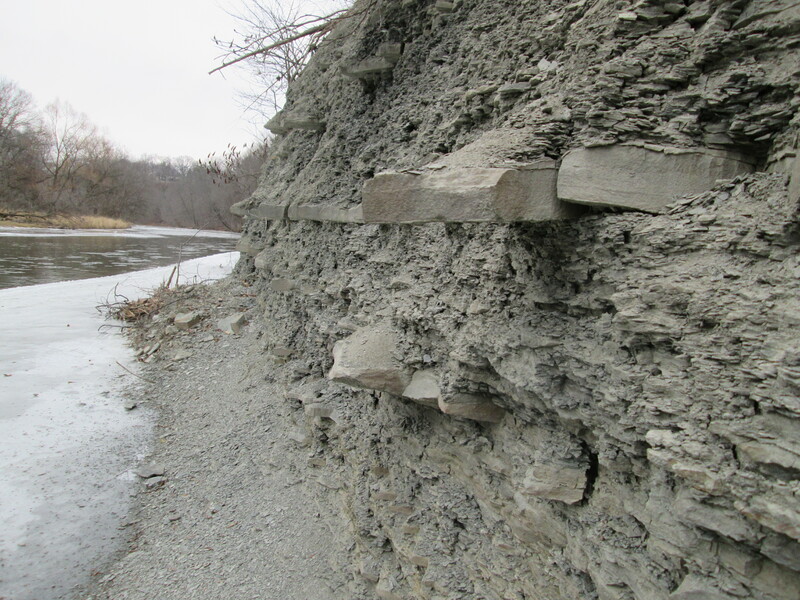 Along the lake shore at the creek mouth, there is a deteriorating break wall that was installed to help preserve the marsh from erosion. 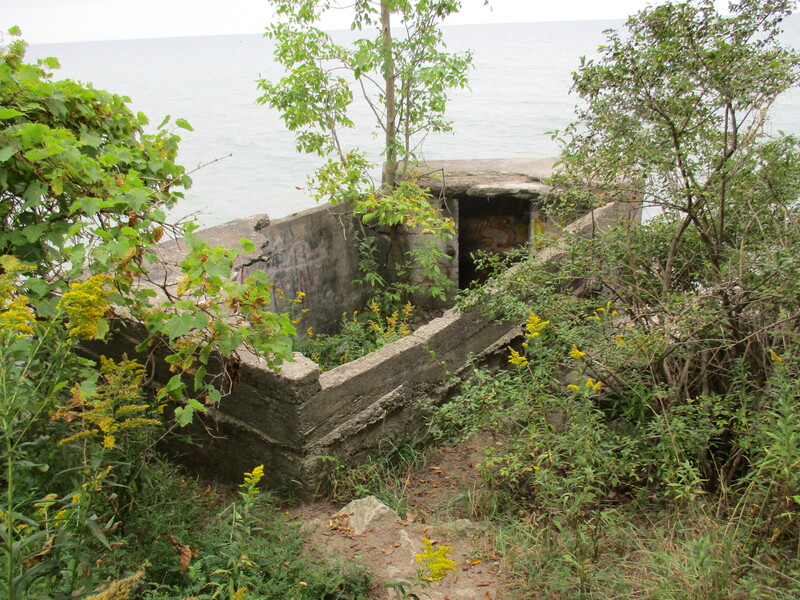 A little east of here a large concrete chamber stands looking out over Lake Ontario. The top is broken off and several small trees are taking root inside. This was likely built in 1918 when Fudger had the house built on the property, He was obsessed with fire protection and built his house out of concrete. This appears to be an old pump house, perhaps part of a fire suppression system. Turtlehead flowers grow in moist soil and bloom from late in August through to October. They get their name from the shape of their white, red or pink flowers which look like a turtle with its mouth open. Turtlehead flowers have been used in traditional medicines for centuries. They make an excellent remedy for skin sores as well as reportedly being used for birth control by some native tribes. They are a favourite food for white tailed deer like the young male featured in the cover photo. Aside from carp, Rattray Marsh has also been invaded by the emerald ash borer. This little green insect kills 99.9% of all ash trees it comes into contact with. Unfortunately, most of the tree cover in the marsh and surrounding area is ash. The picture below shows trees with an orange mark on them. These are infested with the ash borer and will be cut down and replaced with new plantings. Trees that are not infected can be protected against the insect at a cost of about $200 per tree for an injection that must be repeated every two years. Injected trees have a little metal tag on them. On Monday, September 11, 2017, we returned to the marsh to explore the boardwalks and see what the back half of the park holds. The Trans Canada Trail and the Waterfront Trail pass through the 90-acre park on a common boardwalk. There is a secondary trail which is 1.8 km long and a small 0.3 km loop known as the Knoll Trail. 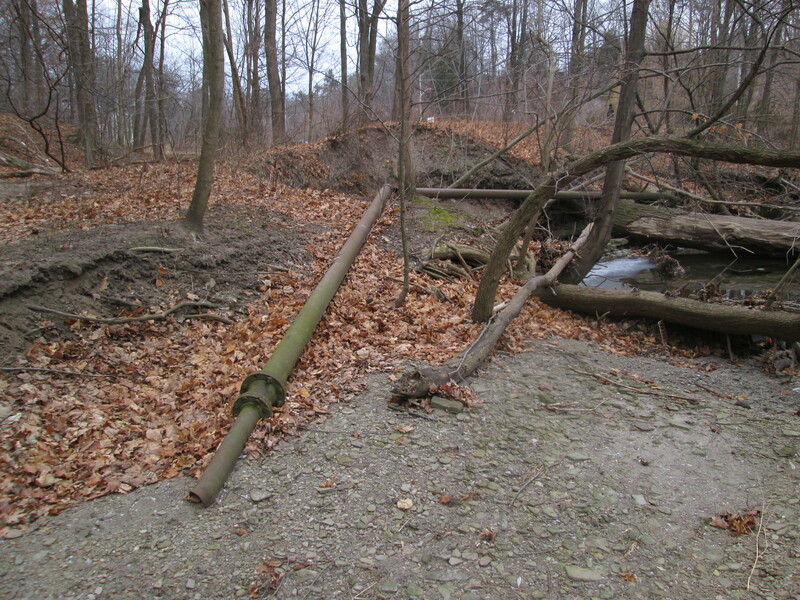 Credit Valley Conservation has recently completed upgrades and replacements to much of the boardwalk around Sheridan Creek and they reopened on September 2, 2017. Rattray Marsh was rather low on water and we could see where it had been several feet deeper recently. 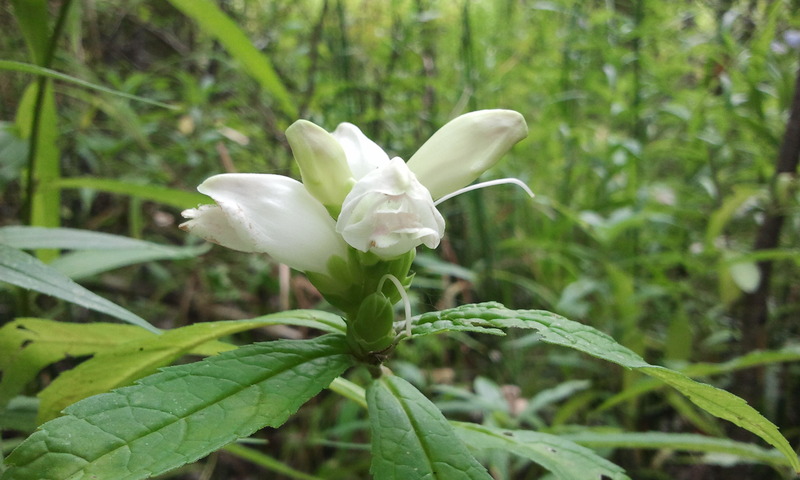 This entry was posted in Mississauga, Uncategorized and tagged Bradley Museum, Rattray Marsh, Sheridan Creek, The Anchorage, Turtlehead flower, White Carp on September 23, 2015 by hikingthegta. The day started off nice at -2 but was predicted to have a storm starting around noon. We parked one more time in Erindale Park. The plan was to enter the west side of the Credit River just south of the Sawmill Valley Creek’s confluence with the Credit. 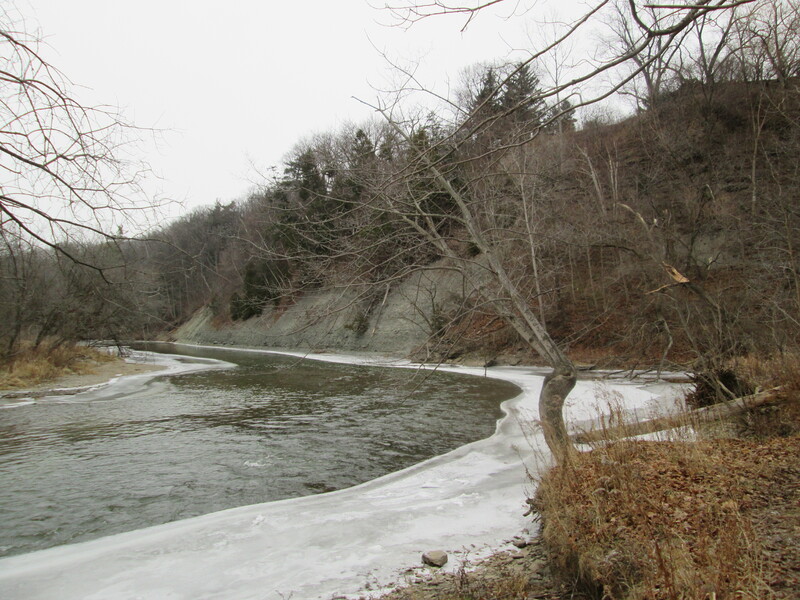 We wanted to try and get to a point across the river from the Erindale Power Plant that we had been seeking when we hiked the Credit River at Erindale on January first. We walked down the edge of Sawmill Valley Creek and turned south along the west side of the Credit River. Almost immediately we came to the foundations of an old building which we identified as a house when we found the swimming pool in the back yard. Keeping to the river side of the fence line, we made our way along the river. Soon we were past the point where we were stopped two days earlier by the shale cliffs on the east bank of the river. 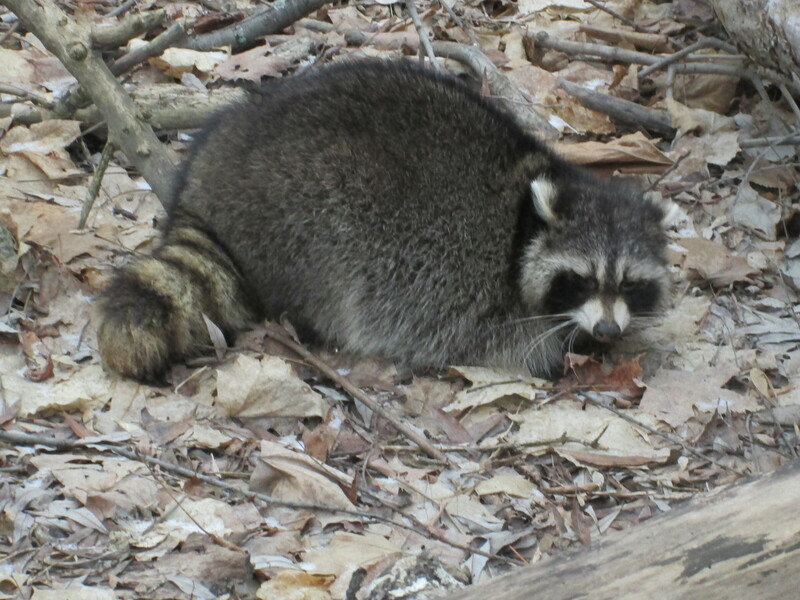 Presently we found a raccoon who, contrary to their normal nocturnal habits, was sitting on the ground in broad daylight. Suspecting that he was ill we acted with caution but there was no aggression. In captivity a raccoon can live for up to 20 years but the normal life expectancy of a raccoon in the wild is less than 3 years. Ones like this that aren’t in peak condition can become dinner to the local coyote helping to keep that number low. As we approached the bend in the river we started to see that the shale banks farther along would pose a problem like the one we experienced a couple of days earlier. At the bend in the river we found the mouth of a small stream and so we followed it west toward Mississauga Road. A little way upstream we started to find extensive sections of old pipe along with concrete foundations in the creek. As we contemplated what their original purpose had been we noticed two people working in the woods with a Bobcat cleaning up fallen trees. The man approached us and we had an opportunity to ask about the pipes. 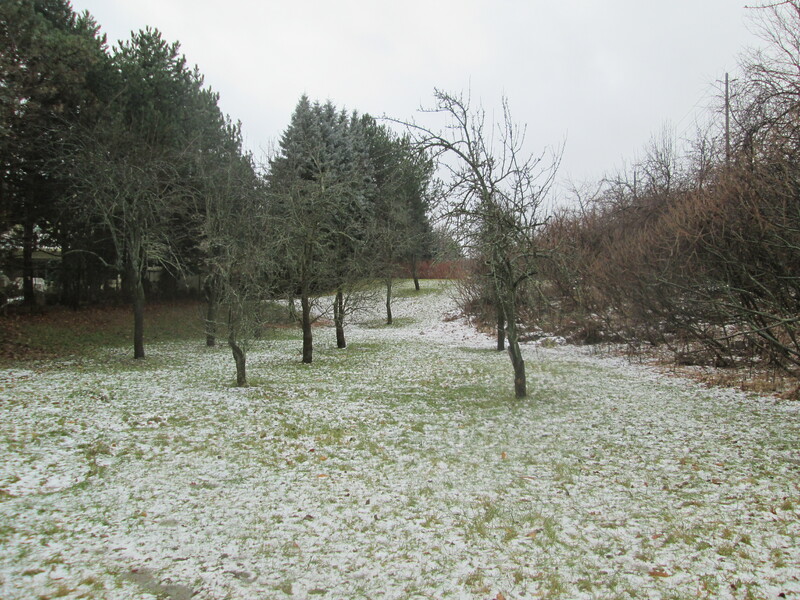 He shared with us that the area above the ravine had been an extensive orchard and in the 1930’s a pump house had been built to irrigate the orchards. He also told us that the creek was named Loyalist Creek. 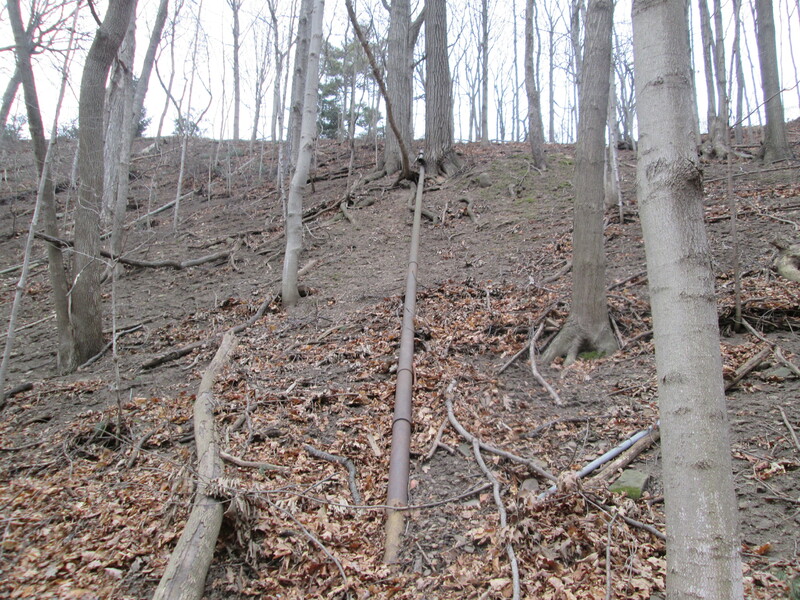 Pipes still run up the side of the hill on the south of Loyalist Creek toward orchards that were already gone by the 1960’s. We crossed Loyalist Creek and made our way as far along the shale cliffs as was reasonable and then turned back. The shale along here has layers of thick harder stone that stick out like rows of broken teeth. Right at the mouth of Loyalist Creek are several pieces of old concrete. We met the gentleman a second time and he had actually never noticed them. It is likely that a dam was placed at the mouth of Loyalist Creek to retain a pond of water for consistent irrigation of the orchards during dry seasons. As we were leaving we encountered the Bobcat operator who was quick to inform us that we were on private property, a fact that her husband had already failed to mention twice. 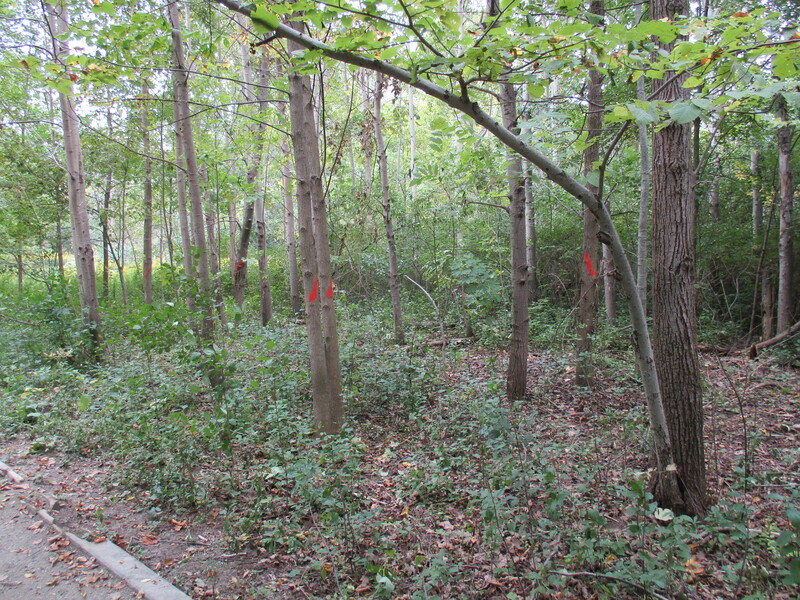 When we got to Mississauga Road we discovered that the property was very well marked with No Trespassing signs. We had missed them by entering along Sawmill Valley Creek. This is one hike that you can’t try yourself. The old concrete at the mouth of the Loyalist Creek is shown in the photo below. Returning home it was time to do some research to see what could be learned. I discovered that the 1880 Historical Atlas shows extensive apple farms around Erindale including the farm of Thomas Hammond. 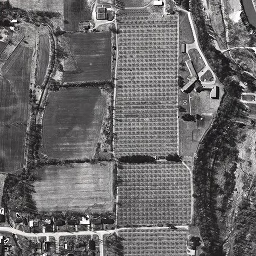 In the 1971 aerial photo below, the Hammond farm has a large orchard that by quick calculation contains over 900 trees. They appear as the straight rows of little dots. The Hammond farm house appears just to the left of the orchard at the top of the picture. It was designated as a heritage building in 1991 and so a quick follow-up appeared to be in order. The area was sold for development shortly after this picture and by 1976 houses had replaced the orchards. 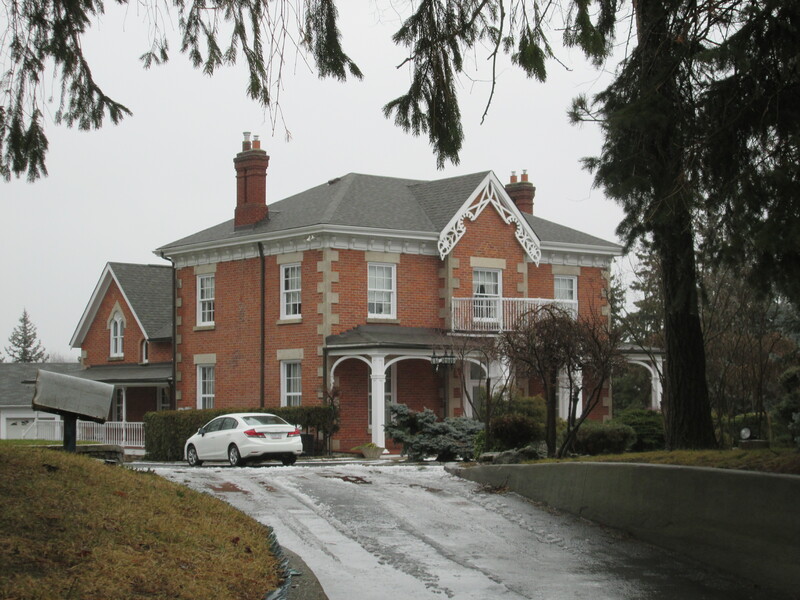 (Sunday, Jan. 4) We returned and parked near the old Hammond house which was built by Oliver Hammond. Oliver was born in 1812 and is featured in the cover photo. Oliver built his house in 1866 and it currently sits on a large property tucked in the middle of the subdivision which was his farm’s final crop. Loyalist Creek flows through the property close to the house. A developer’s proposal suggests that the open space around the house will soon hold 7 new homes. Hammond’s house will become just an odd old house, looking out of place, amid the modern homes on a small cul-de-sac. All that remains of the orchards is three rows of old trees in the park along the side of Lincoln Green Close. It seems like these trees might still produce fruit in spite of their age. Apple trees are not native to North America but were introduced by the French around 1606. The McIntosh apple is named after John McIntosh who discovered a sapling on his farm in Upper Canada in 1811 and cultivated the tree which produced an exceptional fruit. By the early 1900’s the McIntosh was the most commonly cultivated apple in North America. This was due to the fact that it was good for both eating and cooking. I’m not sure what kind of trees these are but they were planted around the right time to be McIntosh. The old Erindale Power Station remains elusive, but there is always future explorations to be made. This entry was posted in Credit River, Mississauga and tagged Apple Orchards, erindale, Erindale Park on January 8, 2015 by hikingthegta.